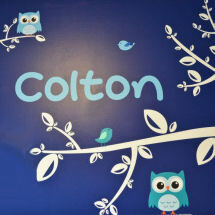 We have some owl baby nursery ideas for parents expecting a baby boy or girl as well as moms-to-be that have decided to let the little one's gender be a complete surprise. 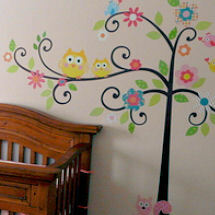 In our gallery of owl nursery pictures you will find baby bedding sets and nursery decorations made by parents that don't mind tackling a DIY or crafts project in order to design unique surroundings for their "soon to be born" child. The various ways that they introduce our feathered friends into the forest theme result in a whimsical room that is as cute and colorful as can be. As you will see from the pictures of babies' nurseries decorated with owls; there are crib bedding sets for boys, girls or collections in neutral colors that will be suitable for either or if you are expecting twins, both. 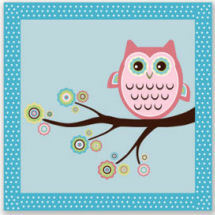 For several years now the owl themed nursery has been very popular in every color scheme you can imagine ranging from pink for baby girls, blue for baby boys and neutral colors like yellow, green and even bright orange! 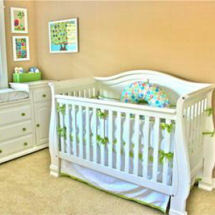 Do you have a great set of owl baby bedding or a picture of a nursery that you decorated with baby owls? Share it! 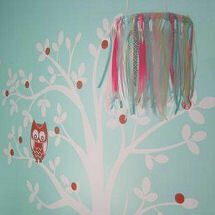 In a contemporary owl nursery theme, the color possibilities for a neutral nursery are practically endless! 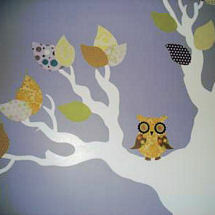 Paint a tree mural on the wall or use tree wall decals and then perch your homemade owl decorations that you cut from fabric in any colors that you need to match your owl baby bedding set. 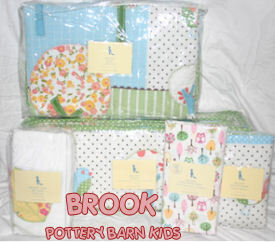 Looney Tunes has a pastel crib set and Pottery Barn Kids has a pretty pastel owl baby bedding collection called Brooke You might want to consider adding a few leaves to match the colors and patterns of the fabrics that you used to make your owls to tie it all together. 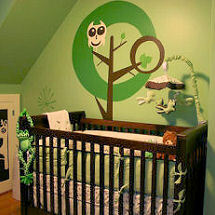 When decorating an owl baby nursery, many decorators feel that keeping a woodsy color palette is best and that the more woodland creatures you can add to keep the baby owls company the better! 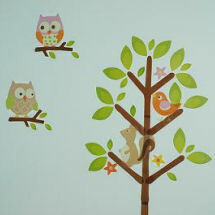 Forest creatures like baby foxes, squirrels and raccoons are always welcome additions to a natural owl themed nursery. The color scheme for this style of owl baby nursery reaches back to the late 70s when it seemed that everything from plaques to kitchen canisters was decorated with either owls or mushrooms. For this decorating project, shades of brown from chocolate to beige with accent colors of orange and lime green will be appropriate. 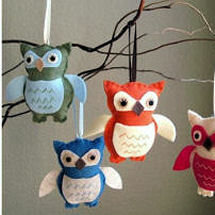 If you are looking for unique or old-fashioned owl baby nursery decor, you might take a look in your grandmother’s attic or garage to see if she has anything saved from this era that you might use to decorate. Please make plans to visit Unique Baby Gear Ideas again soon to see more owl nursery theme ideas with lots of decorations that those of you that are good at crafts will enjoy as well as examples of homemade baby girl and baby boy owl nursery decor and bedding that you can sew yourself.